One of the most popular and successful pieces of music written for piano. This album also has the benefit of being one of the best sounding LPs ever made. Side 2 is a very fine Nights In The Gardens Of Spain. Rhapsody On A Theme Of Paganini, Op. 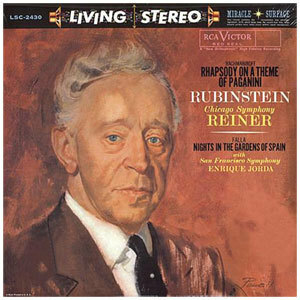 43; conducted by Fritz Reiner and performed by the Chicago Symphony Orchestra. Nights In The Garden of Spain; conducted by Enrique Jorda and performed by the San Francisco Symphony Orchestra. One of the most popular and successful pieces of music written for piano. This album also has the benefit of being one of the best sounding LPs ever made. "...I'd have to say that the usual stumbling blocks have been sidestepped.